Finding the perfect bouquet does not mean that you have to empty your wallet. Sometimes, it’s the simple arrangements that grab the most attention. 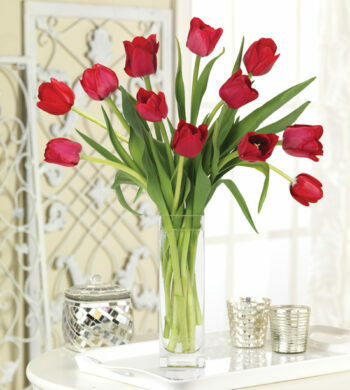 A small arrangement of tulips is appropriate for any occasion and will add a sweet touch of spring to any room. If expressing your undying love through flowers, no matter the cost, is important, then a large bouquet of roses will be sure to leave her breathless no matter the occasion. 2. Choose the appropriate flower for the person. Certain flowers and plants require a little more care and attention than others, and depending on the person who will be receiving the flowers, you might want to gauge their expertise before choosing a flower. For those with little flower experience, start with something small and simple. Flowers arranged in a small bouquet are always elegant and easy to care for. Just be sure to cut the bottom stems about a 1/2 inch under water. Fill a vase with warm water and place the bouquet in the vase, making sure the stems are submerged. Remember to change the water every couple of days to extend the life of your flowers. A good florist will send care instructions with your order. Be sure to read the instructions because certain bouquets might require a few extra steps to ensure that they last longer. 3. Choose the appropriate flower for the occasion. Whether you’re celebrating an anniversary, a birthday, a graduation, a birth or a holiday, there is sure to be the perfect flower for the occasion. Roses are a traditional way to show love and appreciation. 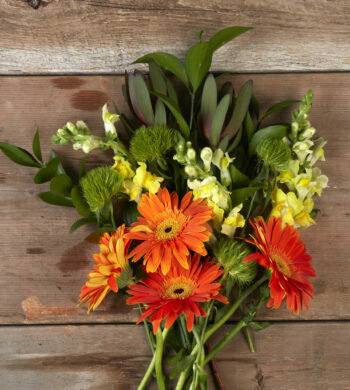 Gerbera daisies are a great, versatile flower that can be sent in celebration of a birthday, a new baby, or even just to brighten someone’s day. A nice plant makes a great house warming gift. Keep in mind that some flowers will arrive in bloom and will just need some water, but other flowers or plants will arrive in bud and may take some additional time to bloom. Be sure to inquire which ones will arrive in bloom and which ones arrive in bud when you place your order. 4. Choose a Florist and order on time. Today most online florists guarantee the freshness and quality of their flowers and plants. If you order from a “direct-from-the-grower” flower service, you cut the amount of time that the flowers spend in a delivery van or truck, which makes for fresher flowers. Or, visit your local florist, where you can personally check the bouquets for freshness. It’s also wise not to wait until the last minute to order your flowers – – especially if you need fresh flowers to arrive on a Monday. For the sake of freshness, most online flower services do not ship flowers over the weekend. 5. Be sure someone will be there to receive the flowers. Flowers and plants don’t stand up well to extreme temperatures. Be sure to send your flowers to an address where someone will be able to receive them and take them inside, remove from the packaging, and rehydrate. Over a year ago, Calyx & Corolla introduced its “Weather Wrap” packaging, an insulating layer of air to protect fresh cut flowers from freezing air in the winter or extreme, or wilting heat in summer. That extend’s a bouquet’s life considerably, but they still don’t want to be sitting on a doorstep for hours! Check your plant daily, keeping it watered and properly drained which is very important. As flowers fade, pinch them off in order to encourage new blossoms. After blooming you may wish to plant or keep your gift outdoors in a sunny area (weather permitting). 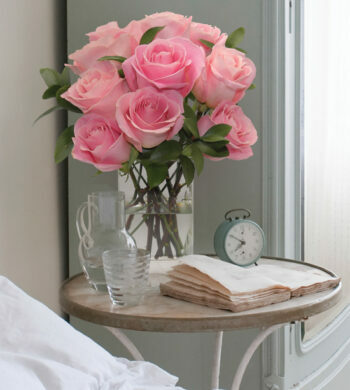 Fill a vase or container with warm water and add flower food as directed. We suggest a warm water temperature, as a flower does not readily absorb cold water. Hot water can shock the flower. Submerging them in fresh, warm water for 5 to 10 minutes can revive wilted flowers. Always cut stems (minimum of ½”) diagonally under water, which allows water to flow more readily through the stem. Begin arranging immediately. Most bouquets will fit nicely in a 6″- 8″ tall vase. 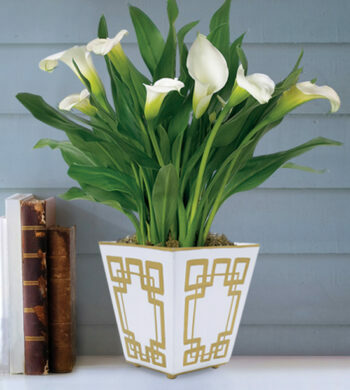 Place flowers in vase or container and keep them out of direct sunlight and away from hot or cold drafts. Be patient. Buds will gradually open from the base of the stem in 2-4 days. Certain flowers bloom quicker than others do. A few upper buds may not open. Trimming blossoms and leaves encourages other blossoms to open and your bouquet will last longer. IMPORTANT! Add fresh water daily and recut stems every other day. To enjoy your flowers for the longest possible time, trim away or discard spent blossoms as your bouquet ages to allow the flowers to channel their energy correctly and rearrange if necessary.